Upon realizing the causes of the mayhem and stalemate in UEW, as a bonafide student of the university, I suggest to the president of the Republic of Ghana H.E Nana Addo and the education minister Hon. Matthew Opoku Prempeh some few ways to quench this ember. 1. Everybody (both students and non-students) knew the university became politicized from the day Prof. Avoke was undermined and legally toppled. The investiture of Rev. Fr. Prof. Afful Broni became "gory matrimony between UEW and Partisan Politics". This gave UEW a latent name " the political university ". 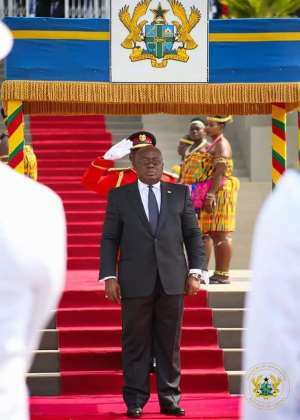 To brainwash this stain, there is the need to call upon the king of Winneba His Royal Majesty NEENYI GHARTEY II to step in and talk to both factions. Why him? During the mayhem on the 14th March, I tried speaking to some colleagues who were seriously agitating and the responses were "only NANA GHARTEY mouth go fit cool we down' meaning only Nana GHARTEY's assurance can calm us down. I further probed these students on the above statement they've made and it was revealed that they don't trust any politician anymore, for they all have dual mouths. They preach virtue and practice vice. Their (politicians) marriage with the UEW has marred their trust in both the politicians and the university management. This politicization affair is deeply ingrained in their minds that any step by the university management is seen as a move to credit a certain political party and therefore will be opposed by the student populace. Mr. President, to save your long-standing dignity if any, in the face of education, NEENYI GHARTEY II must have a say in this. can penetrate, he made the systems more porous by undermining the choice of the students in choosing their preferred SRC President (Hon. PAUL ABROKWA). After this, he made his bait the VC of the university. I, therefore, plead that Mr. President should query Hon. Afenyo and delimit his boundaries in the interference in the affairs of the university in order to save the hard sought and long-standing integrity of the president H.E Nana Akufo-Addo and his tenure at large. I hope my humble submission will do a great deal of service to UEW and Ghana as a whole. THANK YOU H.E NANA ADDO DANQUAH AKUFO ADDO.